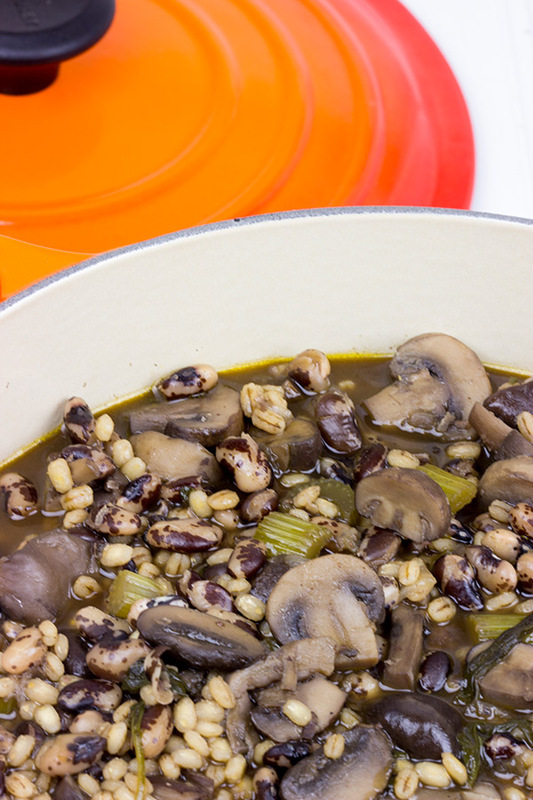 This Wild Mushroom Bean and Barley Soup features several types of ‘shrooms and the magical orca bean! It’s perfect for chilly Autumn days! I’ve always wanted to see a whale. Not like the kind that you might see in a Disney movie. A real whale. I find it fascinating that one of the largest mammals in the world feeds on one of the smallest. And get ready for this…whales eat up to 5,000 pounds of plankton and other small fish a day. 5,000 pounds! So when I found out that you can go whale watching off the coast of Massachusetts, I was all in. A couple of weeks ago, my wife and I piled in the car with one of our friends and headed out to Gloucester, Mass. for a quick weekend trip. The afternoon boat trip was postponed until Sunday due to rough seas, but that’s ok…we just checked out the area instead. Sadly, Sunday’s trip did not produce any whale sightings, but we still had an awesome time out on the water. And we’re planning on heading back in the Spring to see if we can spot some whales. 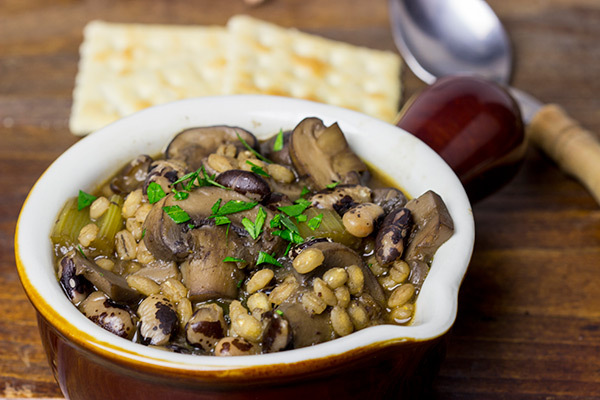 So what in the world do our whale watching adventures have to do with this Wild Mushroom Bean and Barley Soup? Orcas are a type of whale, and I used Orca beans in this soup. (I admit it’s a weak connection, but it did let me tell you about our whale watching adventures!) But back to the Orca beans. Have you guys seen these magical beans? Ok, maybe they aren’t magic…but they’re definitely crazy cool! Orca beans are a little smaller than pinto beans, and they hold their shape well when cooked. That means they’re great in soups! I must admit that I’m pretty excited that Fall is here. That means comfy sweatshirts and curling up on the couch watching movies. That means reading books by the fire. But, most importantly, that means delicious soups! We love making big batches of soup around the Spiced house. Back when we were both in grad school, we’d just pick up cans of soup from the store for weekday lunches. But then we realized that homemade soups really aren’t that hard to make at all. And they’re way tastier! So now we make up a big batch of soup on the weekend, and then we have easy (and healthy) lunches ready to go for the week. Tasty and easy…that’s how I roll. 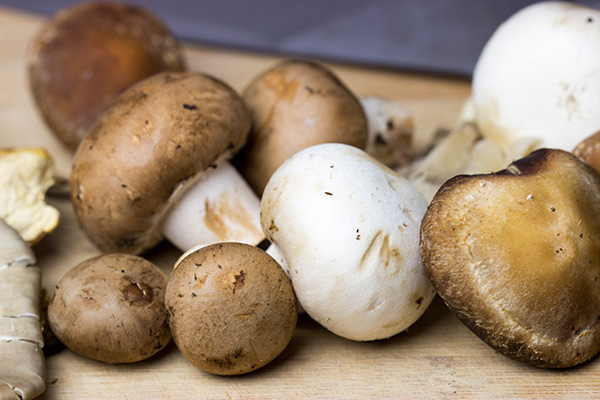 Before we get to the recipe, can we talk for a quick moment about mushrooms? For me, mushrooms were always a means to an end. They provided special abilities. They turned regular Mario into Super Mario. But actual mushrooms? Eh. They’re just one of those foods that I’ve had the hardest time appreciating. It’s not the flavor. (I discovered truffle oil a few years back, and I love it!) It’s the texture. But I was determined to like mushrooms. I kept giving trying them and trying them…and now I can honestly say that I enjoy mushrooms. I’m still a little skeptical about a big pile of sauteed ‘shrooms on my plate, but I love them in soups. So when I saw the Orca beans from Bob’s Red Mill, I knew I wanted to make a mushroom soup. And I didn’t skimp on the mushrooms, either…I think there are 3-4 different varieties in this soup. Oh, and I threw in some dried porcini mushrooms for an added boost of flavor, too. This was the first big batch of soup for us this Fall, and I gotta say that it’s already one of our favorites. 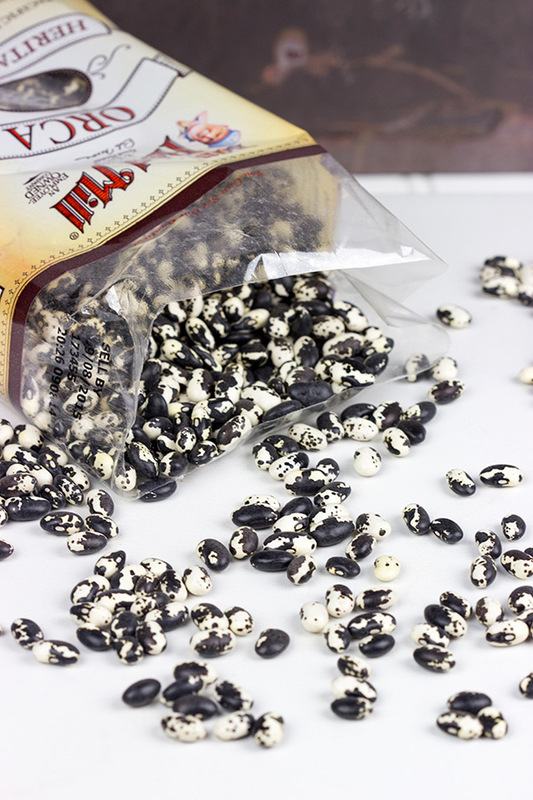 Want to give Orca beans a shot for yourself? That can be arranged! I’ve teamed up with the awesome folks at Bob’s Red Mill to give you a chance to win some Orca beans along with a $50 gift card to their online store. (Pssst…if you win, then grab some barley, too. You’ll need it for this soup!) Seriously, though, I’m a huge fan of Bob’s Red Mill, and I’m lucky enough to have a store right around the corner that stocks their entire line of beans, grains, oats, flour, etc. 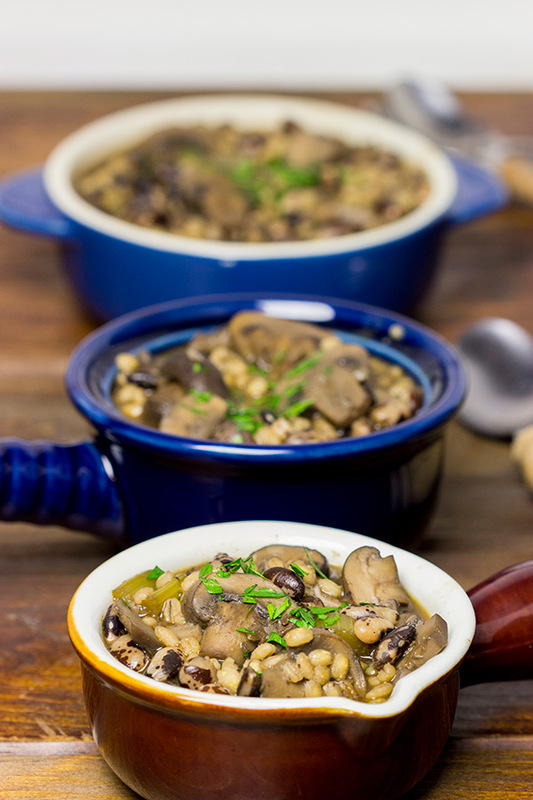 So here’s to comfy sweaters, early season fires and many bowls of this delicious Wild Mushroom Bean and Barley Soup! 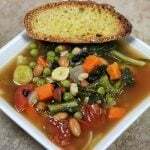 For more delicious recipes, check out the Bob’s Red Mill website. I’ve found a bunch of really great recipes on there…now I just need to find time to make all of them! Add sherry and cook over medium heat (uncovered) for 15 minutes, or until mushrooms are soft. Place the dried porcini mushrooms in a food processor or mini-chopper. Pulse until finely ground. Add dried mushrooms, vegetable stock, spinach and orca beans. Bring to a boil. Reduce heat to medium-low and simmer for 30 minutes. Add the barley and simmer for another 30 minutes. The opinions and recipe are all my own. 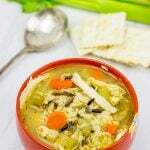 LOVE this soup and LOVE comfy sweaters with extra long arms that act as protestants from extra hot bowls of soup! Soup is the only reason I don’t hibernate all winter! 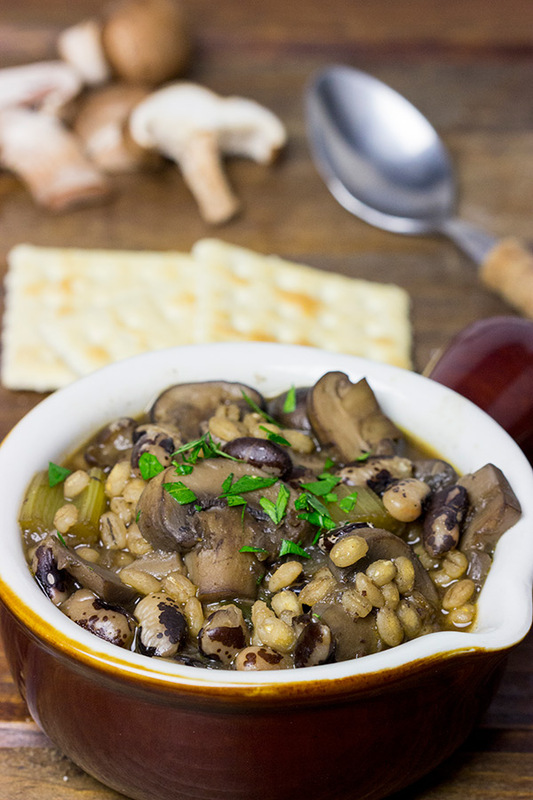 Oh – my fav fall soup would be anything with lentils and beans! Y’all freeze soups? No mater how large a batch I make, it never lasts long enough to justify any being frozen…guess I need to find me a gynormous cauldron or something! Well, we do make HUGE batches of soup. I don’t think I have any recipes that don’t feed a small army…haha! That’s where the freezing comes in. Plus, it’s nice to mix it up a bit and bring a soup back out 2-3 weeks later. For the longest time I couldn’t stand mushrooms. The texture and slicing them made me cringe. Happily, I am over that and now love them. I’m am also happy for Fall and soup season. This soup looks delicious. I haven’t seen orca beans before and can’t wait to try them. This looks and sounds delicious. I could eat mushrooms everday and never get sick of them. So making this. That looks like such a comforting and delicious soup. Perfect for this kind of year. Ooo…sausage and lentil sounds delicious, Linda. Thanks for commenting! My favorite fall soup is Minnestrone! I love so many soups, hard to pick one. I cannot wait to try this amazing soup!! My favorite fall soup – butternut squash! I have never heard of orca beans — so pretty! In fact, I want to make some kind of third-grade-style dried bean art project from them. Maybe a wreath. I’ll keep you posted. Meanwhile, don’t hate me but when I went whale watching off the Cape, we not only sighted some humpbacks, we got to PET THEM, they were that close. OK, you can hate me — it was really awesome. Yummy, can’t wait to try!!! My favorite is lentil soup! I just made some yesterday. I’m a big fan of mushrooms and hearty soups. This soup looks delicious! My fav fall soup is the multi grain and bean soup with heirloom tomatoes and chicken! Oh, heirloom tomatoes! What an awesome addition to Fall soups, Div. Thanks for stopping by! I live for creamy squash soups in the fall! I love serving them over wheatberries or grilled cheese. 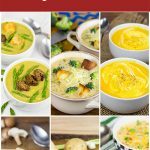 My favorite fall soup is probably a tie between split pea and butternut squash, but this recipe looks delicious! Can’t wait to try it. I’m so glad I found this recipe! We just placed an order for some shiitake mushrooms that will be perfect in this. The site I ordered from is called http://wholeearthharvest.com/. Now I just need UPS to hurry up so I can start cooking! 🙂 Keep up the good work David. Thank you! Awesome! Thanks for sharing that site, Sarah…I’ll have to check it out. I was lucky enough to find some shiitakes locally…but it did take a couple of stops. I hope you enjoy this soup as much as we did! Hmmm…now that it is bitterly cold outside, I’m pretty sure another batch of this needs to show up in my kitchen soon. Thanks for being a fan…and happy 2015! This is one of the BEST recipes I’ve found yet! I made a big pot of it for a potluck and everyone enjoyed it. I can hardly wait to make it again. It was the first time I’d ever tasted Orca beans or barley. Both are now new additions to our yummy list! Wow…thank you so much, Marcia! Your comment totally made my evening last night when I read it! 🙂 Orca beans sure are a fun one…in fact, I should use those more often in other soups. Happy soup-season, and thank you so much for coming back and commenting! That really means a lot to me!